Trunch is a small village which lies a few miles inland of Mundesley. The name may be derived from Le Tronchet Abbey (which had possessions in Norfolk) or from the Celtic for 'wood on a promontory'. 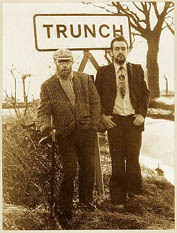 Sid Kipper and his father Henry Kipper (one time double act - The Kipper Family) hail from the mythical village of St. Just-near-Trunch. After Henry retired from show business Sid, the self-styled Norfolk megastar, continued to ply his trade as story teller, folk singer, comedian, occasional actor and player of the walnut shells. Unfortunately, at present, there is no monument in the village to commemorate these famous Trunchians - or should that be 'Truncheons'? In 1994 Sid Kipper (alias Chris Sugden) published Prewd and Prejudice which is the diary of a lady called Miriam Prewd who moves from London to St. Just-near-Trunch in an attempt to bring civilisation to the villagers. Here she encounters many strange Kipper family ancestors including the three-legged Albert Kipper. 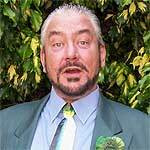 Sid Kipper has also written Cod Pieces and The Crab Wars. Cod Pieces is a fine collection of short stories (all with a Kipper twist) and includes: David Kipperfield, the St. Just So Stories by Rudyard Kipper and Dot Kipper's Handy Household Hints. Another fascinating piece of Kipper literature is Man of Convictions - the autobiography of Sid's nefarious uncle George. Norfolk champion Keith Skipper describes Sid as someone who 'captures the true spirit of Norfolk, teaches it tricks, then sends it to run riot across the land'. There is obviously something in the water in this part of Norfolk as another great folk singing talent - Walter Pardon - was born at nearby Knapton. Pardon was discovered in the 1970s by Peter Bellamy and then took his Norfolk songs as far afield as the USA. In 1983 he was awarded a Gold Badge by the English Folk Dance and Song Society. It would be interesting to know how much he influenced his Kipper neighbours. The hammerbeam roof of St. Botolph's Church in Trunch provided the inspiration for Rev Whitwell Elwin's spectacular creation at Booton.